This guide gives details of how to use the ‘Hourly Pay’ columns in Payroll Manager so that ‘Hours Worked’ are displayed on the payslip. Note that if you are currently using the ‘Basic’ pay column to enter pay for an employee who is paid according to the number of hours worked then you should change the way that you enter pay from April 2019 in order to comply with this new legislation. 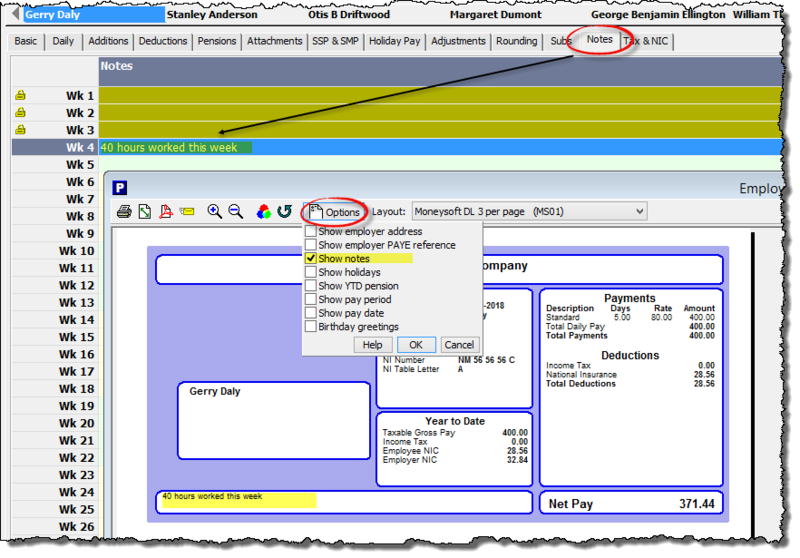 It is possible to customise and use up to 10 different hourly pay columns. 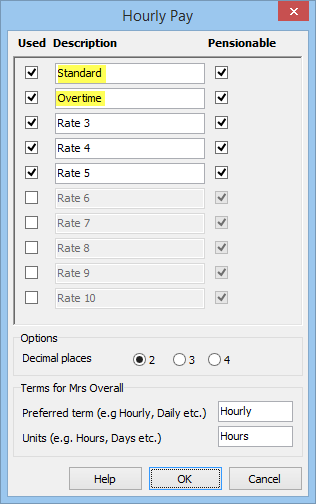 You should choose an appropriate name for each column (standard, overtime, night-shift etc) and set whether the item is ‘pensionable’ or not (typically these columns should be set as pensionable). The names of these columns apply to all employees in that particular payroll data file. If you wish to add more columns, tick the box marked ‘Used’ and name the column accordingly. It is also possible to choose the number of decimal places and the terms and units that will be used. Click ‘OK’ when you have finished editing this screen. The columns that you have created will then appear in the ‘Hourly’ section of the ‘Pay Details’ screen. Ensure that you have the correct employee selected, then click in the ‘Rate’ column in the pay period that you wish to set the rate from, enter the relevant hourly rate for that employee, and press the ‘Enter/Return’ key on your keyboard. It is possible to ‘copy’ this rate into all future pay periods by clicking on the ‘Copy this cell to all below it‘ button on the toolbar, as shown below. Note that this sets the rate of pay for one employee only. If you wish to set the same rate for all employees then click on the ‘Copy this cell to all below it for all employees button‘ on the toolbar instead. It is possible to have different rates of pay for each employee – e.g. employee John Smith may have a ‘Standard’ rate of £8.21, whereas employee Benik Afoebe could have a ‘Standard’ rate of £5.50. You should select each employee separately and specify each rate accordingly in such cases. Click on the ‘Hourly‘ tab on the ‘Pay Details‘ screen, select the appropriate employee, and enter the number of hours worked at each rate in that particular pay period. ..and a payslip for that pay period gives the employee a breakdown of the number of hours worked at each hourly rate. 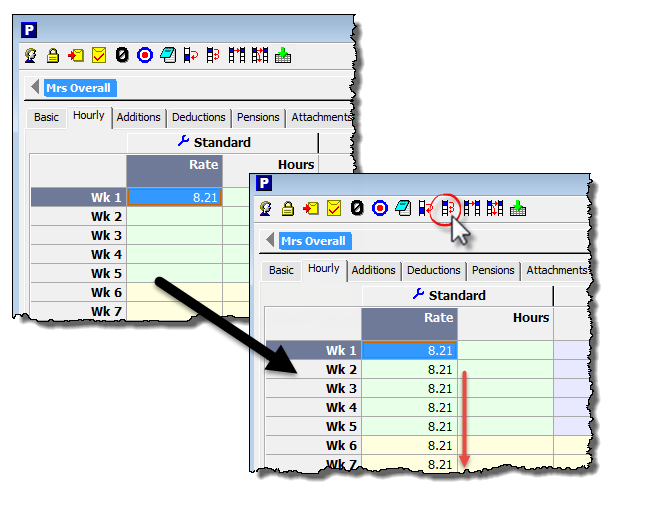 If you were previously using the ‘Basic’ column to record pay rather than the ‘Hourly’ columns then you should check that you don’t still have duplicate amounts entered in the ‘Basic’ column, and remove these if necessary. – What if my employees are currently paid at a daily rate, according to the number of days worked – do I still need to show the number of hours worked in these cases? – Yes, and this becomes more complicated, as you may not already be entering the number of hours worked by the employee in order to calculate their pay, but instead are entering the number of days worked in that pay period. In such cases the payslip cannot automatically show the number of hours worked, as this data has not yet been entered into the software. 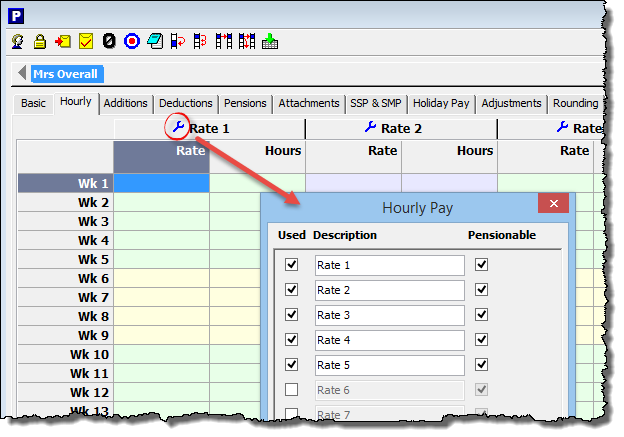 If you wish, you could use the ‘Notes’ column on the ‘Pay Details’ screen to record the number of hours worked by the employee in that particular pay period, and then choose the option to ‘show notes’ on the payslip (example below). In this way it is possible to show the number of days worked, the daily rate, and also the total number of hours worked in that period on the payslip.